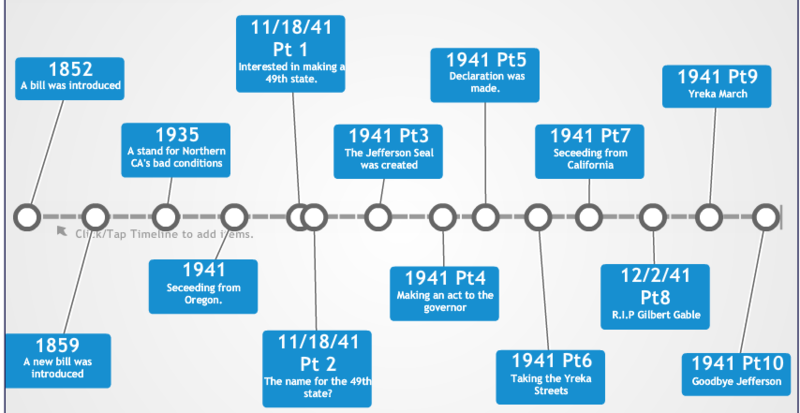 In 1941, the members of the Yreka Chamber of Commerce, in isolated Northern California, had experienced the negative effects of Southern California getting better services than Northern California for too long. The Commerce members took a stand by creating a proclamation to create the State of Jefferson between Northern California and Southern Oregon. Proponents felt that there was an unequal distribution of money and services between Northern and Southern California and they would be better served by being on their own . 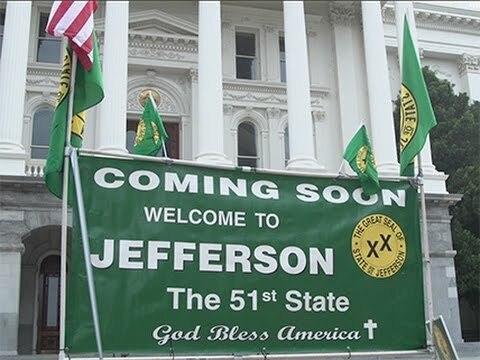 Many people in this region still have a strong sense of local identity and the dream of “The 51st State of Jefferson” remains alive today. 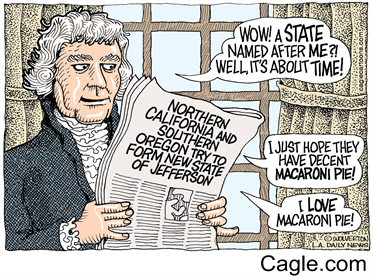 Thomas Jefferson reading about a state named after him and date unknown. Political Cartoon from Cagle.com. Interview by Don Hall with a Siskiyou County Pioneer named George Walker, about the start of the State of Jefferson movement, Footage from 1941, Documentary Date is 1992, the source is Youtube. This interview explains the origins of 1941 State of Jefferson movement. State of Jefferson Timeline, April 2017, Cheng Yee. The original source is Timeline.